The One percent from which all propaganda flows can be referred to as the Oligarchy. Take a look at the top of this page and consider the Tower of Babel of Genesis 11, the EU Parliament building in Strasbourg France, Time magazine's Woman Riding a Beast and the Economist Magazines - Rise of the Phoenix (1988). The Babylonian mystery religions of Theosophy and Freemasonry empower all Global structures today, they are profound and undeniable as Luciferian Spiritualism controls every facet of our world. Most individuals living within these power structures, aka North America and the EU prefer not knowing the details of the powers in place, they are resting in their slumber and content with their ruling class, some even approving of the controlling hands over them. That it's better not to know these details, allowing others to live in ignorance of this veiled environment. Today you have two choices, you can choose to rest in your slumber concerning the veiled environment around you, or you can take the knowledge available and protect yourself and your family from it, you will not do both. Ignoring this hidden environment will keep you bound in your slumber, which is exactly where Lucifer and his minions of the system desires you to be. Today's world is controlled by emotions and before you say this is a good thing, stop and consider that your emotions are good and virtuous only if they are guided by a Godly conscience. One able to discern good from evil, one not seared with a hot iron. 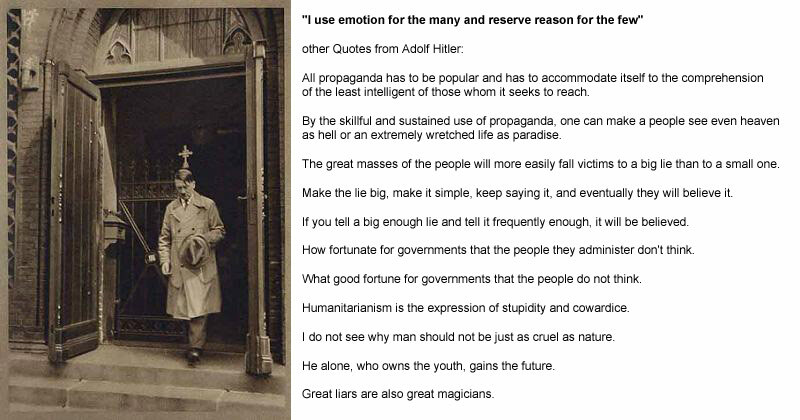 Adolf Hitler said it best when he said "I use emotion for the many and reserve reason for the few." Reason being for the worthy Esoteric Oligarchy of today, and their minions, and emotion for the Exoteric population of society, or the many resting in their slumber. Only innocent in Spirit, to recognize the wolf pack without engaging in their meal. Lucifer, however has credited most of his success to the ignorance of his victims and until you understand how mankind reached this pinnacle of Luciferianism, you will never brake free from the Labyrinth that surrounds you, which continues to lure the masses into Lucifer's maze of deception. Identifying the details of this Maze is of great value because it will reveal the snares before you, providing you with a way of preparation or escape. Today, having the ability to approve what is good and abhor what is evil is of great value as well. Technology has progressed gradually over the last few generations and we have lived our entire lives inside this Labyrinth so its easy for us to confuse this playground of technology which has been built around us with actual biblical blessings. They substitute Godly emotions with socialite technologies like Facebook, which is as Godless as they come. Lucifer is very skilled at using our emotions to lure us into one of his many snares, lust of the eyes, lust of the flesh, the pride of life are proven age old techniques, we live in a cosmopolitan world of eye candy, an endless cycle of veiled Luciferianism. Some say exposing Lucifer's world structure only provides him with another lure to draw people in, but I say, at least they were warned before they made their choice. Today, we live in a knowledge explosion like no generation before with vast amounts of knowledge at our very fingertips. Lucifer has this worlds wealth, power and technology and he has every intention of using it to be like the most high, to be god on the throne of your life and although Lucifer has been called many names, his name has no priority as long as you worship him in your life through your choices. Since the biblical fall of mankind in Genesis 3, there has only been 2 Spiritual passageways, the straight/narrow or the broad/wide path. Lucifer's labyrinth being the wide and broad way, Jesus of Nazareth being the straight and narrow way. Matthew 7: 13-14 Enter in at the strait gate: for it is the wide gate, and broad way that leadeth to destruction: and many there be which go in thereat. Because the gate is strait, and the way narrow that leadeth unto life, and few there be that find it. Today's technology is built on man's intellect but, who gave mankind this gift of intellect? God the Creator, or Lucifer? Both paths of Matthew 7 begin in the Garden of Eden where this Luciferian Conspiracy took form. The bible proclaims us to be separate, in the world not of the world having no fellowship with the unfruitful works of darkness, reproving them through Jesus Christ of Nazareth.